Welcome to the farm! Our farm is located 1 mile west of Lincoln, just behind Pioneers Park. We hope you love raw milk the way we do! We milk a few cows and raise some pigs on the milk we don't sell. We very much enjoy the benefits of raising our own food and living on a farm. We are excited to share these benefits with others. We milk year round and have plenty of fresh, clean flavored milk and cream. Our goal is to manage our farm in the most natural and efficient way so that we can provide our products at a reasonable price. The purpose of this website is to share information. I hope to continue adding more information each week. Dairying and farming on a very small level present very specific challenges. It is also very hard work and we are always looking for ways to improve and streamline. We always enjoy talking with others who are farming or milking cows or who have done so in the past to compare stories and ideas. For those who are drinking raw milk, purchasing farm products, or thinking about milking a cow or farming; we hope this site helps you understand the challenges, work and rewards involved in raising animals and food. Raising animals is like raising children. Everyone has different beliefs and methods. We strive to manage our farm in the most natural and organic way possible. We get information from the media and people around us and use that information to further develop our beliefs and practices. We have found that farming ceases to be fun when we have so many animals that we feel like we can’t manage them properly. We are not able to spend all of our time working on the farm. We have children and other jobs and responsibilities to focus on as well. We sometimes try other animals or have a few more cows or pigs or chickens to test our limits and abilities and then adjust to a manageable level. For me, the difference between milking two cows and milking three cows is pretty big because the extra ten or fifteen minutes it takes to milk that extra cow in the morning before work adds a lot of stress. Josie was born in Lincoln, Nebraska, but was raised on a dairy farm in Minnesota, where she fell in love with milking cows. At age 13, her family returned to Nebraska and she graduated from Milford High School. MIlking has always been important to her. In high school she chose to milk a cow and two goats by hand each day before and after school. She earned a bachelor of science degree in Food Science from the University of Nebraska in Lincoln. She worked at a cereal manufacturing company from the Spring of 2000 until the spring of 2012. She became a Certified Health Coach in the spring of 2015. Christopher and Josie were married in 2002. 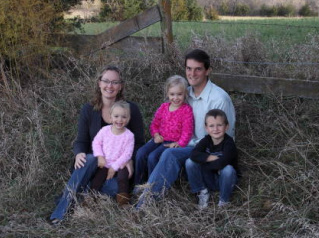 Christopher fixed up our acreage in Cordova and we sold it in 2007 to purchase our current farm. That same year, Josie's parents were trying to figure out what to do with the last 2 heifers they had from their herd. They offered to give them to us to milk, if we wanted. So, Christopher built a small milking barn, Josie's parents gave us the cows and the milking equipment and we started milking in November of 2007. The week before Christmas 2012, Christopher was diagnosed a brain tumor. He had surgery the second week of January 2013 and determined the tumor was Stage IV Glioblastoma Multiforme. They treated his cancer all naturally. He died in July of 2014. You can read more about their journey in Josie's upcoming book.